Dark matter, to re-interpret Obi Wan Kenobi, surrounds us and penetrates us. It binds the galaxy together. Remember, this is a model, and not an actual map. It does show concentrations of dark matter along galaxies and clusters of galaxies, but also shows how even "empty" space well outside of galaxies has pervasive dark matter in it. OK, so what’s the deal then? A lot of things are dark. Cold gas. Dust. Rogue planets. Burned out stars. Black holes. It’s hard to see how there could be more mass in any of these things then all the stars put together, let alone ten times as much! Still, over time, better observations started eliminating all the possibilities. Basically, everything made of normal matter was eliminated as a candidate. The Sherlockian conclusion is that something extraordinary makes up dark matter. The most likely possibility now is an exotic form of matter like axions, subatomic particles that have mass and gravity, but don’t emit light and don’t interact with normal matter. An axion could pass right through you, and like a ghost it would leave no trace. But that doesn’t mean we can’t detect it. Just like we discovered it indirectly through its influence gravitationally, there is another way to "see" dark matter: gravitational lensing. In a nutshell, matter warps space, and light moving through that space follows the warped path. This can distort the shapes of distant galaxies, either strongly, really messing them up and bending them into long arcs and making multiple images of them (like in a recent and pretty Hubble picture of a galaxy), or it can be a weaker effect, gently smearing out the galaxy’s shape. Dark matter has mass, which means it has gravity… so it should create gravitational lensing. In this illustration, imagine a bunch of background galaxies depicted by the points on the left. Plop a galaxy with dark matter between us and them, and the galaxy’s gravity warps the light from those more distant objects, bending the grid and also magnifying the background galaxies. All of this information can be used to map out the location and density of the dark matter doing the lensing. 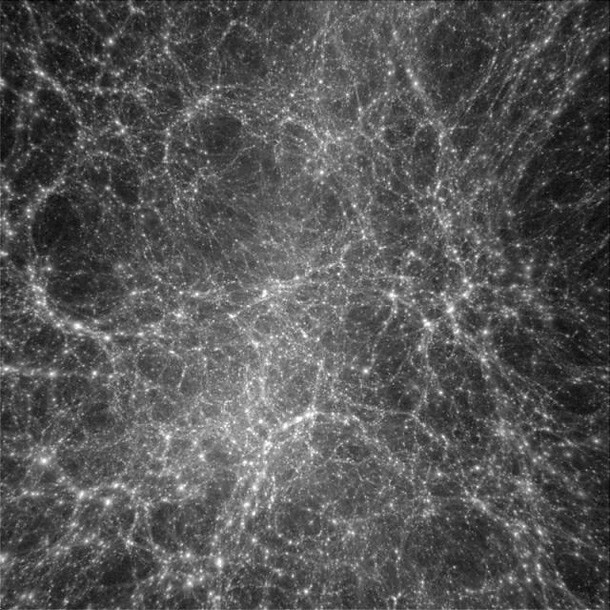 Last year, astronomers made an incredibly detailed map of dark matter using an astonishing 24 million galaxies. By carefully measuring the shapes of these galaxies (using automated software) they could tell statistically how much the images were warped, and therefore how much dark matter there is, and where it’s located. Mind you, you can’t really point at any one galaxy and say it’s distorted by such and such an amount. But we know overall how they should be shaped, so by mapping millions of them (millions!) you can show statistically how they deviate from the expected shape. That in turn tells us about the dark matter between us and them, and this information was then used by the Japanese researchers as a test of their computer models of how dark matter behaved. That’s how they made the map above, and showed that dark matter extends well beyond the visible borders of galaxies. And because dark matter outweighs normal matter in our Universe by so much, the researches involved have actually said that galaxies really don’t have boundaries. In a sense, they’re right. What we see is only a fraction of what’s really there. And since the dark matters extends so far past the limits of what we see, galaxies really don’t have borders. They just thin out over huge distances of space, overlapping. I picture it a bit like a mountain range: there are local peaks, but at their bases all the mountains merge together so it’s hard to tell where one ends and another begins. Amazing. So, did you catch all this? Let me explain… no, there is too much. Let me sum up. Matter that we can’t see directly but we know exists but can’t be normal matter or even interact with it directly bends space which warps the path of light which can be used if you have millions of galaxies at your disposal to see the subtle distortions of background galaxy light which smears them out and lets you map the location and density of that invisible matter and see that it’s everywhere even well outside the visible boundaries of galaxies which means it fills the Universe in every direction and at all distances.